The Seattle-based company makes devices that regulate voltage flowing into buildings, which can shave 5 percent to 8 percent from power usage. MicroPlanet is tackling an often-overlooked source of inefficiency in the power grid – the high voltage electricity from utilities. The Seattle-based startup makes devices, now being used by about 20 utilities and commercial customers including Whole Foods and Flying J, that can help cut their power usage by 5 percent to 8 percent, said CEO Bruce Lisanti. It does that by leveling out voltage entering homes and buildings, he said. While utilities strive to deliver power as close to 120 volts as possible, the nature of the distribution grid leads to that voltage ranging in a band between about 126 and 114 volts, he said. Higher voltages equal wasted power, since excess voltage is dissipated as heat from devices, he said. And because many devices are designed to operate best at 110 to 114 volts, subjecting them to higher voltages can wear them down, requiring them to be replaced more frequently, he said. Leveling out that voltage, "will lower the customers energy bill, but it will also improve the quality of their power," Lisanti said. That can cut maintenance costs quite a bit, he said – one Marine Corps base bowling alley in Hawaii that installed MicroPlanet devices was able to cut its electrical equipment maintenance costs by about $20,000 a year, which along with overall power savings cut the projected payback time to less than two years. Previous voltage regulation technologies used up to 6 percent of the power they were transforming, making them inefficient for utilities and customers, he said. MicroPlanet, founded about eight years ago, spent the first six years developing technology to squeeze that power loss down to less than 1 percent, he said. Since then, MicroPlanet been in various pilot projects, many of which have led to commercial deployments, with commercial customers and utilities including Hawaiian Electric Co., Scottish and Southern Energy, AES Corp. and the Sacramento Municipal Utility District. SMUD, for one, found using MicroPlanet's devices could cut air conditioning bills by about 10 percent, important for curbing peak power demand, Lisanti said. Hawaiian Electric, BC Hydro and other utilities offer rebates for customers to install the devices, he noted. A number of Australian utilities are using MicroPlanet's devices as well, with about $10 million in backlog orders to date, Lisanti said. The devices can range from about $1,000 for a residential unit deployed by a utility or developer to $100,000 and up for a commercial building unit. Voltage regulation hasn't received nearly the amount of attention as have other smart grid efforts such as the millions of smart meters being deployed around the world, Lisanti noted. But he sees what MicroPlanet does as a more efficient way to deliver power savings than "asking someone to turn down their air conditioner," as a smart meter could do if hooked up to home or business energy management systems. That's an observation that's been made by others in the smart meter industry as well (see Notes From a National Smart Grid Experiment). At the same time, MicroPlanet can install its technology inside meters, and is talking with three or four unnamed meter makers about doing so in the future, he said. 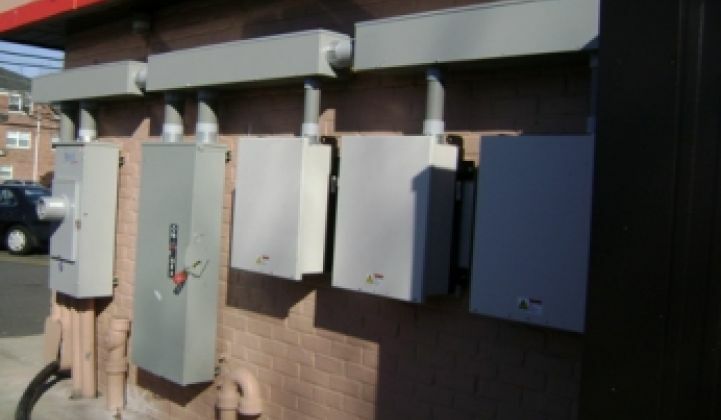 While utilities can now manage voltage at the substation level, "We allow them to fine-tune the voltage location by location, which is what really makes the difference," Lisanti said. Regulating voltage can also help stabilize the grid, something that will become more and more important as more distributed generation sources like solar and wind power come online, he said. Given that about two-thirds of power is lost to inefficiency between generation and end use, according to the Department of Energy, helping customers shave percentage points off their power usage could be one of the cheapest ways to meet future power demands, he said. MicroPlanet went public on the Toronto Stock Exchange in 2005, and Lisanti said it's on track to reach profitability in the next year. The company reported a 2008 loss of $5.4 million on revenues of $726,000, compared to a 2007 loss of $3.3 million on revenues of $23,000.